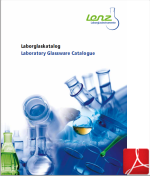 continuous endeavor for advanced solutions Lenz Laborglas is a leading manufacturer of laboratory glass instruments worldwide. With more than 10,000 standardized articles, we offer our customers an outstanding range of glass instruments. Our product range includes general laboratory accessories, flasks, separating and dropping funnels, chromatographic columns, components and condensers, extractors, water stills, reaction vessels and glass filtration instruments. Besides our standard range and components we manufacture individual solutions on tailor-made base. With our various processing and refining options, we are able to optimize solutions to your requirements. Glassware for manipulators as ground joints, stopcocks, tubing connectors and flasks top off our product range. The production of our laboratory glass instruments is determined by state-of-the-art process-technology. An attendant quality management system assures a constant product quality. We feel obligated to the progress of modern technology and the growing demand of our clients.